It's that moment that you remember forever - your first kiss. Just how do you kiss? What are different kissing techniques? What is a good kiss, or a bad kiss? 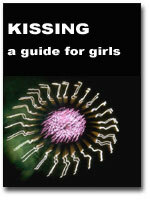 Everything a girl needs to know about kissing well. On one hand, you don't necessarily want to start off as being an "expert kisser". That gives the guy the impression that you've been with 100 guys, which is not a good thing as far as a guy is concerned. But on the other hand you want the kiss to be *nice*, not sloppy and icky. This ebook will help you find that perfect type of kissing technique. The cost for this ebook is $5.99. All of our sales are handled through PayPal, an online free service. When you finish paying for the ebook, please be sure to follow the final link in order to return to the RomanceClass.com site and finalize processing.